I’ve had a bit of a think. I need to blog more. For those of you following so far I focussed a lot of my writing on PR and social media, but I’ve decided to branch out. CHAPATI MAN. I found their website and it looks like a good venture. 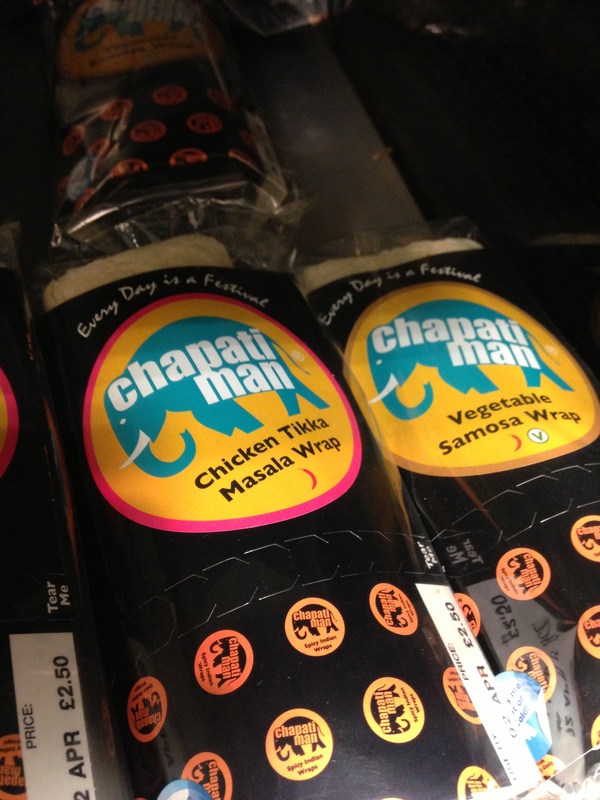 Snacks and wraps in supermarkets and at festivals. However the key to really good Indian food is authenticity in my opinion. Countless times have I told friends that the sign of a good curry house is when Indians eat there. When it comes to curry standards, we’ve got the highest there are. It must be something to do with growing up eating daal chaaval and chicken saalan every night after school. If I put my professional mind to work, Chapati Man needs to gain that authentic seal of approval. If people see it being eaten by Indians, they’ll trust it. A huge generalisation, but I challenge anyone to tell me that they haven’t wanted to try one of the curries they see their Indian friends eating. Word of mouth within the Indian community is so important. It’s a PR-person’s dream. Find your target audience and get them to do the work for you – the power of earned media, whilst hard to measure, can be your most powerful marketing tool). There were countless times when my mum would discover a new restaurant or cash and carry and tell all her friends about it. Whilst she might now be starting to use Facebook, it’s still very much a case of old school seeding and awareness raising. Home grown British and South Asian Brands such as Pataks, Symingtons’, and East End Foods, have all done well to become trusted and household names within British Asian communities. Again this has been developed by a strong sense of community and understanding of “core business” that is at the heart of all these brands and indeed British Asian communities. I think the next challenge and opportunity will be an “embracement” or indeed an interest in “other” leading community foods as genuinely authentic tasting snacks – West Indian food, Kosher, Polish, Turkish etc… Humous is so generic now that I think most people wouldn’t even know that it’s from the Med. The more Patty-mans, Yiddish-mans’ …. the better! To say – bloody hell why do I always hit reply too early?- to say that I think you should blog more often. That’s all. Thanks Holly! I will certainly try. And yes I think you’re right – chicken tikka masala is a Brummie invention. Sorry to be a pooper Holly – but as a brummie who would no doubt take the credit for such a chicken tika invention – need to pass the credit to the Glaswegians. They nurtured the ingredient and took it global ( well past Blackburn) …. Yes to more blog posts Asad!